It’s like sushi, minus the rice-induced sushi coma! 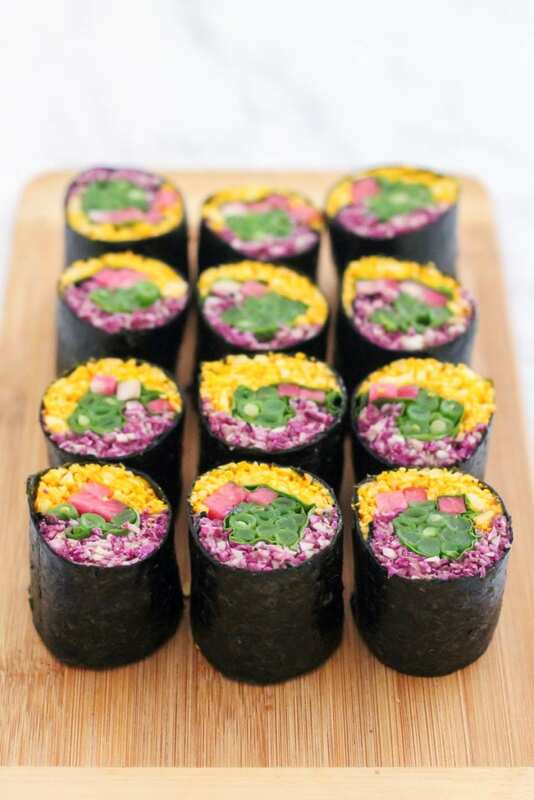 This easy DIY paleo sushi roll tutorial provides a step by step process for beautiful, rainbow-coloured rolls made with cauliflower rice instead of grains. Check out the ingredients list for inspiration and mix and match to create your own! Ever since I was a kid, I’ve loved creating with food. Play dates with my friends often included decorating cookies, Easy Bake Oven parties and gingerbread house decorating. Whenever I sat down to a bowl of mac and cheese, I’d draw some sort of masterpiece on top with ketchup before digging in. I recall one of my favourite science projects at school being a competition to see who could build the strongest bridge out of uncooked pasta. I guess all these childhood signs might help explain why recipe development and food blogging were such attractive creative outlets to me when I fell so in love with them 8 years ago. 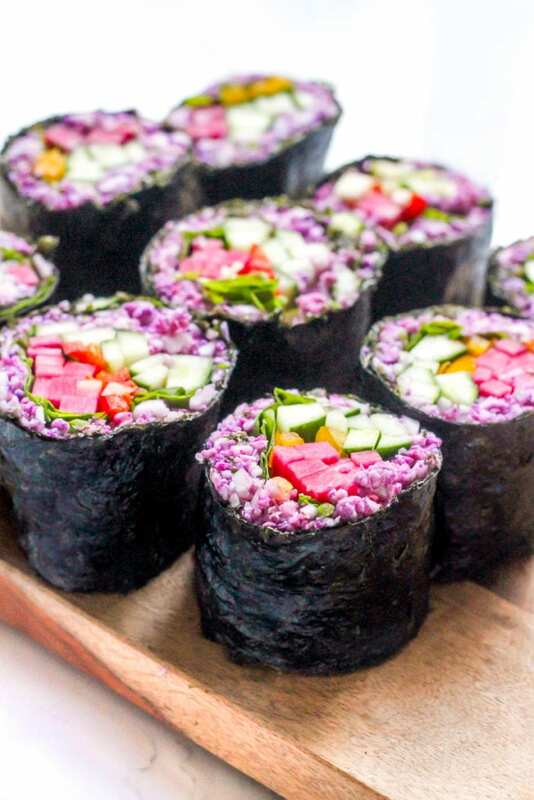 Since moving to California, a lot of my weekend kitchen playtime has been spent creating multi-coloured paleo sushi rolls. 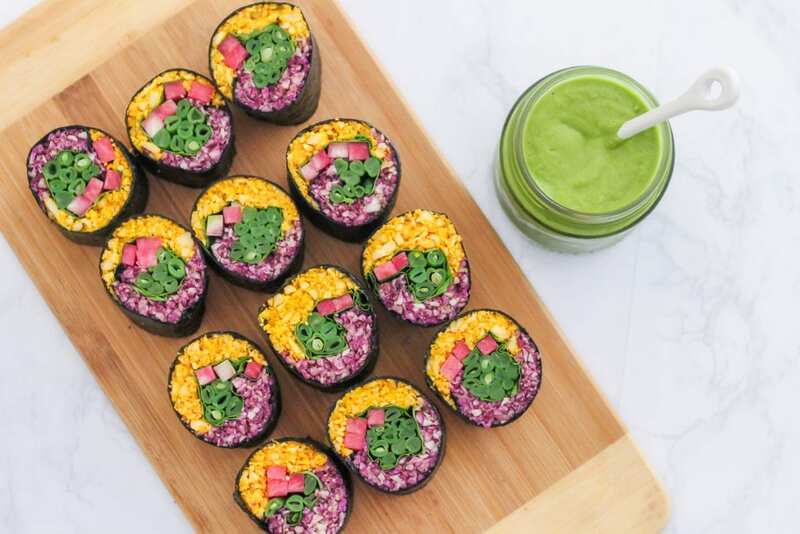 There’s something about pretty food that makes it that much more delicious to eat, and I love the whole process of putting these together – from shopping for a rainbow of fresh ingredients to taking the very last bite (and all the bites in between!) They’re delicious as mid-afternoon snacks or appetizers, and hold up surprisingly well in the fridge for several days after being made. Before making my own sushi rolls, I assumed rolling them up was a feat best left to the pros. With any sort of edible wrap, be it rice paper rolls, nori sheets, collard leaves or tortillas, I always try to cram way more filling inside than they can handle. Not surprisingly, they break open and I end up with a bowl of delicious mixed fillings… and a crumbled wrap on top. All very delish of course, but not as Insta-worthy as neatly wrapped rolls. When I finally realized that the same doubling-up trick I use for fresh spring rolls could be done with nori sheets too, sushi roll making became SO much easier. To show you how it works, here’s a step by step photo tutorial, as well as some ingredient inspo so that you can create your own! a bamboo sushi mat – if you don’t have one, you can find ones like this on Amazon for super cheap! As you’ll see from this list, the ingredient combinations are endless! Feel free to choose whatever you like from this list, and note that cauliflower rice provides a nice cushion to prevent the other ingredients from piercing the nori sheets so I don’t recommend skipping it. 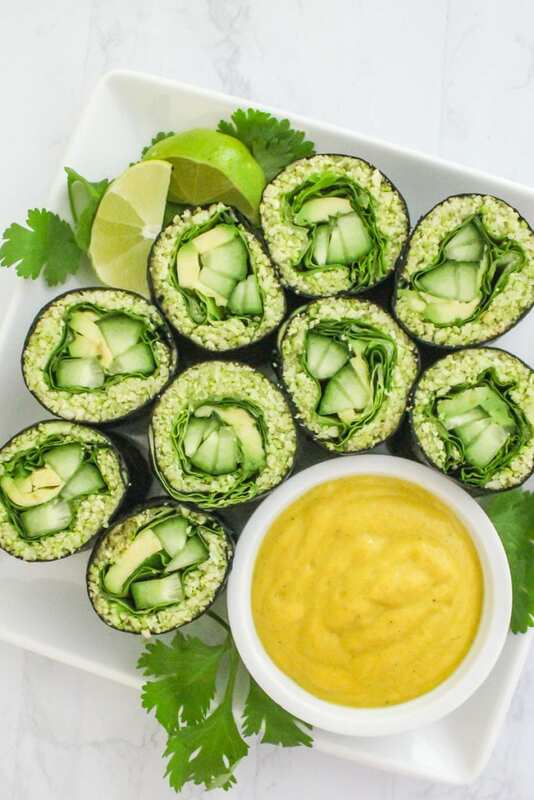 (You could, of course, use sushi rice or quinoa here too, but the rolls would no longer be paleo.) Whatever fillings you choose, aim to keep the julienne cut ones fairly thin as this will help when you slice the rolls into smaller pieces. Start by laying your sushi mat on a flat surface with the bamboo pieces running horizontally. Arrange two nori sheets, rough side up, with one overlapping the other by about 2 inches. Dip your fingers in the warm water and run it along the edges of the nori sheets that overlap. This will act as the glue that holds the sheets together and makes the nori stronger. 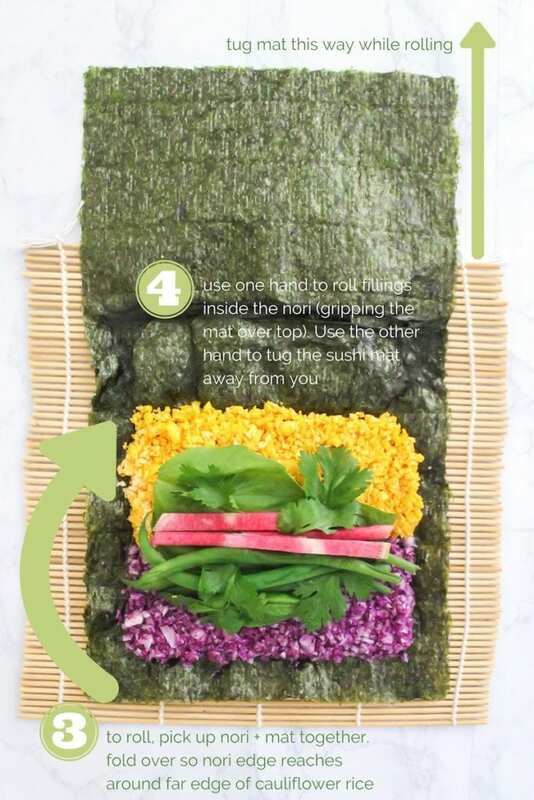 You’ll have what looks like a long rectangular nori sheet (and don’t worry if it looks ugly on the overlapping area – this won’t be visible later. Scoop enough cauliflower rice to create an even, rectangular layer onto the nori sheet nearest to you. Leave about 1/2 – 3/4 inch from the left and right edges of the nori sheet. Follow with a little bit more of each of your fillings, keeping them all on the cauliflower rice ‘cushion’. 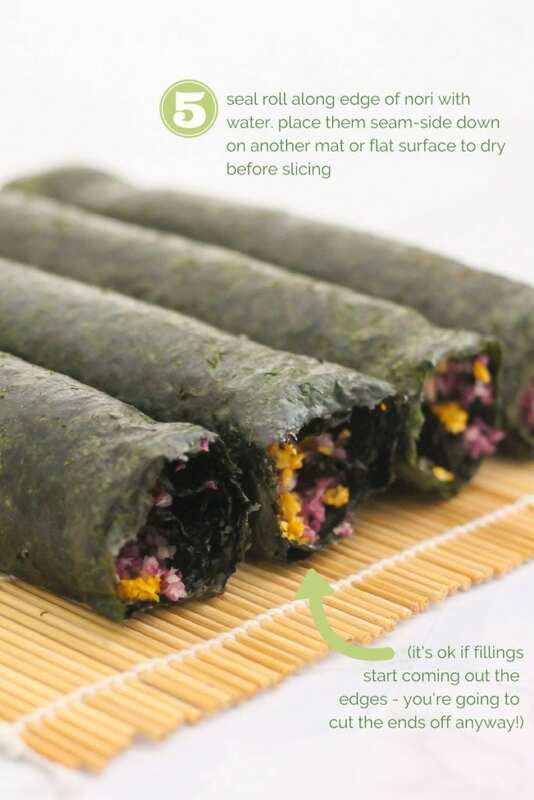 For best results, don’t stack them any higher than 1 inch above the nori sheet surface. Once all fillings are arranged, pick up the edge of the sushi mat nearest you, along with the edge of the nori sheet nearest you. Quickly fold it over so that the nori edge falls approximately on top of the edge of the cauliflower rice. (In the case of the image above, it’s the edge of the yellow cauliflower rice that you’re aiming for. Keep one hand on the roll pulling it towards you, and create tension in the sushi mat under the roll by pulling the opposite end away from you. This will help to ensure the fillings get tucked in nice and tight, without tearing the nori. Continue rolling until you reach the far edge of the nori sheet. Dip your fingers in the warm water and run them along the edge of the nori to create a seal. Place the roll seam side-down on a plate or other flat surface and allow it to dry. 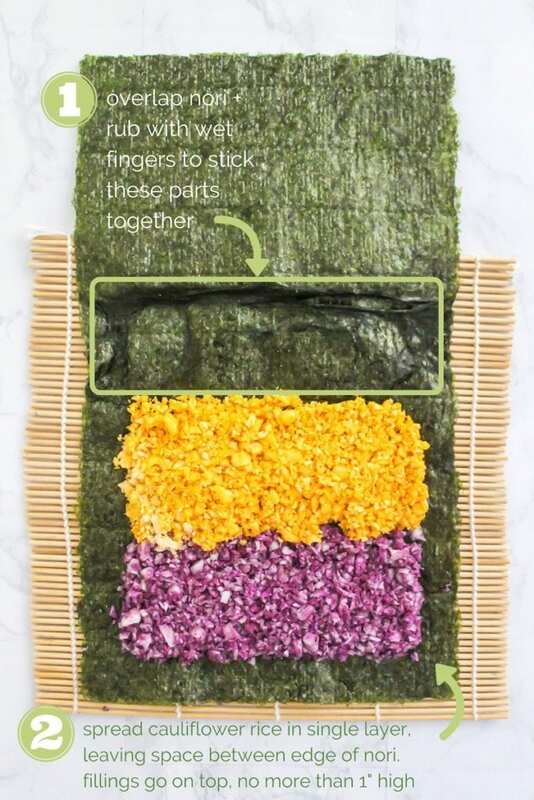 Repeat the process for your remaining nori sheets and fillings. Once all assembled, let them sit for at least 15 minutes. Using a very sharp knife, slice about 1 inch of the end of the roll where the fillings are loose. 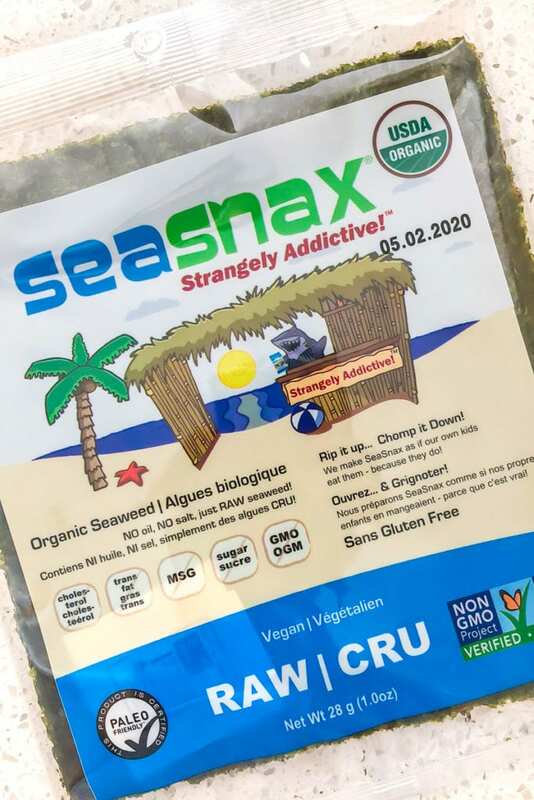 (Feel free to eat it!) Slice the rest of the roll into pieces about 1 inch long, arranging them on a serving plate. You may want to wipe the blade between cuts to avoid getting bits of cauliflower rice stuck on the outsides of the nori. 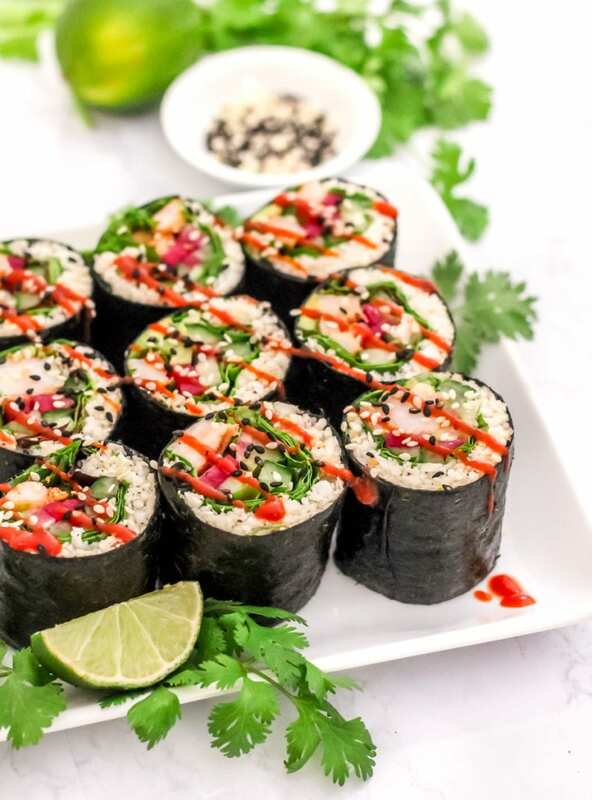 Serve your sushi rolls drizzled with your sauce of choice, and/or torn fresh herbs, sprouts, sesame seeds, fresh lime wedges for squeezing… whatever you like! 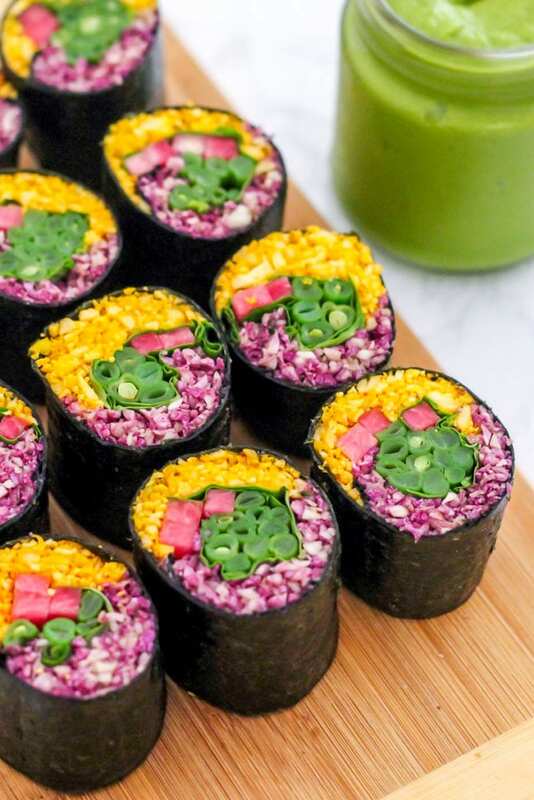 Now I’d love to hear from you… if you could build the ultimate sushi/rainbow roll, what would be inside? Do you ever make your own? Sounds great Cara! Can’t wait to see! This looks truly amazing! Like you, I’ve been intimidated by the notion of using a bamboo mat to make rolls, and nori? Same thing…but now I’m so inspired and can’t wait to throw my next dinner party after mastering the helpful tutorial. You make it look so easy! You are so welcome, Shari! I hope you enjoy making your own, and that your dinner party guests do too!